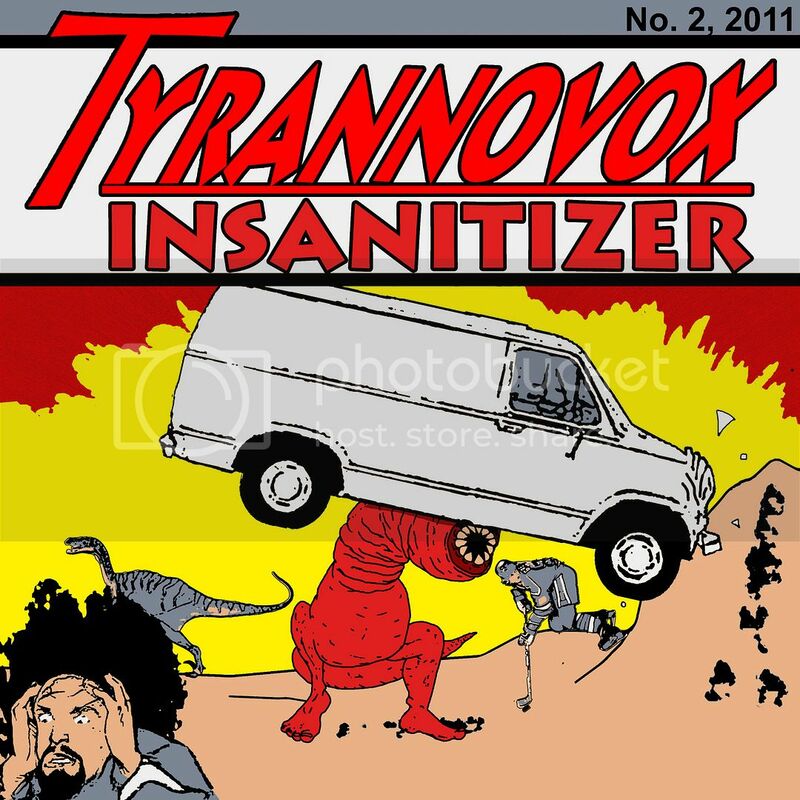 Tyrannovox: "Band of Bandz," plus more gear secrets! "Band of Bandz," plus more gear secrets! First off, a bit of news about what we're up to currently. Q106 is hosting a tournament for Lansing area bands, called the "Band of Bandz Competition." There are 70+ bands involved. Each band will play one show per week with two other bands, and the best band will advance to the next week. We have already played and won our first show in the contest. Shows will be on Thursdays, Fridays, Saturdays, and Sundays at Uli's Haus of Rock, Oade's Hidden Camel, and Level II. We'll be playing one show per week for as long as we're in the game, and we'll try to let you know the specific day and location each week. Last week, we played at Oade's and melted enough faces to win the night. We should find out where and when we're playing this week soon. Stay tuned. Mike is currently using a Randall Kirk Hammett stack, which uses Randall's tube module technology. It's huge and loud. He still uses the GNX3000 in front of it to get his sounds, so he runs the Randall clean. For practice and smaller shows, he uses the Fender amp, which is mostly reliable despite a strange intermittent buzz that afflicts it from time to time. I've switched to a Crate GTD120 combo. It's much louder and clearer than the Rogue, and, for a time, I was using the Marshall Guv'nor pedal in front of it. I would plug in clean, get my saturation from the pedal, and use the amp's onboard reverb and delay effects for ambience. I loathed the amp's onboard modulation effects and kept them down to zero. The amp was unfortunately modified in a car accident. The modulation knob snapped off, freezing it in an unfavorable position--i.e. anything other than zero. There is an input in the back of the Crate which allows the signal to bypass the preamp controls and run straight into the power amp, which is how I use it now. The Guv'nor only includes dry distortion, so I'm back to the GNX3. After selling off my Kramer, I moved onto a Agile AL-2000, which is a Les Paul-style guitar that I equipped with a Seymour Duncan Custom-Custom pickup, and a Schecter C-1+, which I kept stock. I quickly discovered that the Agile is a little too heavy for me--almost 12 pounds of solid mahogany. When my Rogue amplifier fried a fuse, I bartered away the Agile for the Crate amp. I eventually got another guitar, a Douglas WRL 590. It's a set-neck Strat with a Floyd Rose system that I partially blocked so that it won't float or raise, but will still dive. I also put in a Seymour Duncan JB humbucker. It's my go-to guitar for Satriani-style screams and other such nonsense. Mike has used a variety of guitars--Ray's Ibanez, my Schecter, and an Ibanez RG--but he has finally settled on a Gibson Les Paul. A real Gibson Les Paul, as he never gets tired of telling people. It's a terrific slab of mahogany that he's used at every practice and show since he got it. Last year, we recorded and compiled our first disc of songs, which we call Guano Loco. Those sessions occurred before Mike and I got our most recent guitars, and I believe the majority of the tracks were recorded by DI'ing our pedal boards to the computer. You can check out the tracks in the left sidebar on this page. For a record that was made in a basement, Guano Loco has good production standards, thanks in no small part to Adam's skills behind the console. My one regret is that Mike and I recorded the way we did. 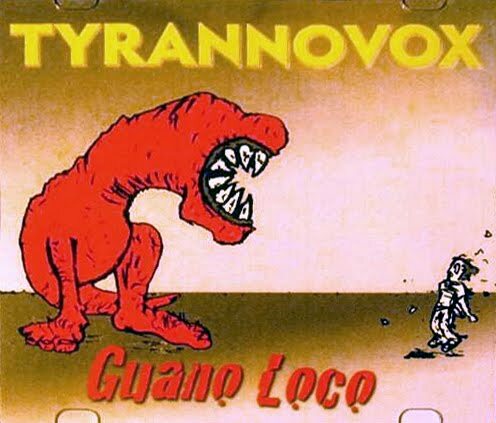 There is a quality to the sound of real, moving air and natural acoustics that makes guitars sound infinitely better, and that's what we're missing on Guano Loco. To compound the trouble, I had a crisis of faith with the sound that I was getting from my custom settings on the GNX3. On Guano Loco, I defaulted to one of the stock presets that I didn't use before and haven't used since. That buzzing mess of thin, mushy distortion in the right channel is me. I'm not sure why I chose it, because it bears little resemblance to the more Van Halen-esque distortion that I like. Guano Loco wasn't just a way of preserving our songs. It was a way of learning to record, and of figuring out what to do and what not to do. Our current batch of recordings is coming along. As good as the last one sounded, this one sounds even better. The guitar sound is particularly improved. Real microphones! Real moving air! Real everything! It occurred to me recently that a lot of the great rock records are a mystery. The people who made them don't remember how they made them, what gear was used, what order things were done in, and so on. Nobody thought it was important to write this stuff down, and they'd forgotten it all by the time they realized that it was worth caring about. I'm not comparing us to those guys, but I do think it's good to write these things down while they're still fresh enough to be remembered. One day, we can reminisce about the stuff we used to use, back when we played music.